Well I am really pleased with this one - I couldnt be leaving that bit of Blue Awning just lying around but tearing into it was worse than cutting into it. Anyway Im not sure what the other papers are but I am pleased with the amount of texture I got on this, which was what i was aiming for. for once, the photo is one I had actually taken myself and was quite pleased with. 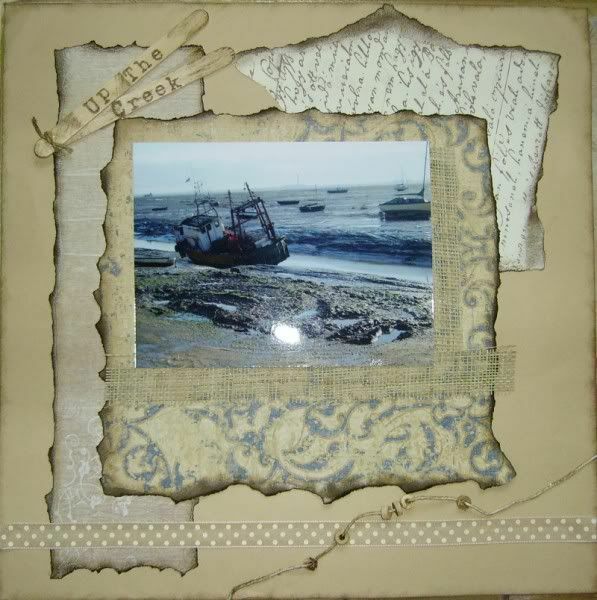 Its the creek at Leigh on sea. What a superb match of papers and colours. Loving the string and lollypop sticks. What did you ink the edges with? They look really, really good. Mia, this one is one of your very best. Just my colours and ideal for the creek photo too. Love, like Lorraine, the lolly sticks. It is a great layout and I might just have to scraplift it!! aww thanks... must admit I think its one of my best too. Walnut ink and the lolly sticks were in my altered art box (things go into that box and not much seems to ever come out). I liked the effect too and so will be looking for more lolly sticks now. I stamped them with those omnipresent letter stamps Lorraine gave me - couldnt live without those. Absolutely gorgeous!! Love your choice of papers and ink, and I think the way you've done the title is inspired! I need details!!!!! Walnut ink? What..the spray bottle or an ink pad? What colour did you stamp the title? If that's also walnut ink, then whose pad is it? I can tell you it's Tim (God of crafts) Holtz Walnut Stain ink pad which she does round the edge with a little spongey thing. It is (for both of us) the best of all ink pads for anything vaguely distressed looking. The other one we use (for a more reddish colour) is Aged Mahogany. Ah, thought it might be. Jolly good. I'm sorted then. Thanks, Patty. Smashing page Maria, a real competition winner if you know of any happening anywhere. Maria, this takes me back to my childhood. The creek was a playground for us kids on Canvey. I love this LO to bits. Love the colours on this one Maria and the piccie too. I've got some of that blue paper and think it's gorgeous. Have got the swirl floral to go with it too - think I've used them on one of the CJ's but can't remember which one! wow, thats really nice to come home to, all these comments. yeah, Tim Holtz distress inks in walnut on everything including the lolly sticks. I use that the most and spiced marmalade second most. Bummer. I've looked through my pads and I've got every colour except the darned walnut. Could've sworn I had it, lol. Best get it then, 'cause that colour is brill. Yes, it's in the top 5 LOL, I want to see this in a mag, terrific, what are the things on the string, beads?